Tony Soares, City Council president in Hoboken, N.J., once campaigned as a champion of the "little guy." The message was clear in the campaign flyer last May. Tony Soares stood in the front row for the practical purpose of being seen, but he was just another City Council candidate. That's the way he wanted it. Soares, 38, is a second-term councilman in Hoboken, N.J., a city on the banks of the Hudson River between the entries to the Holland and Lincoln tunnels. He is also 4 feet 2 inches tall. 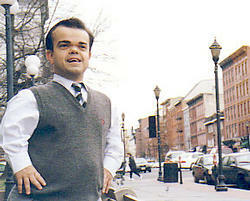 Soares has achondroplasia, a form of dwarfism that has affected the way others have looked at him for most of his life. Being a person of short stature in a world built for average-sized people is not easy, and the constant curious looks from people on the street only make matters worse. To take on a career in the public eye only magnifies that exposure, hampering the pursuit of the kind of quiet, ordinary life that many of us take for granted. "It's very difficult to be anonymous sometimes," said Cara Egan, spokesperson for Little People of America, a support group for people of short stature founded by the dwarf actor Billy Barty in 1957. The organization, which defines "little people" as anyone shorter than 4 feet 10 inches as an adult, estimates that 30,000 Americans, or about one in 10,000, fit those criteria. Egan said that while people of short stature have benefited in their everyday lives from the Americans with Disabilities Act, they still fight an uphill battle when it comes to image. "Negative stereotypes still thrive," Egan said. "TV, video and the web still promulgate them as much as they fight them." Soares, who was elected City Council president by his peers last year, is one of a handful of people of short stature who have fought through the stereotypes to achieve political success. In Texas, Houston voters elected Joe Roach, also a dwarf, to their City Council, and President Clinton appointed Paul Miller commissioner of the Equal Employment Opportunity Commission. The late Alvin Shpeen, who was 3 feet 6 inches tall, served as the mayor of Glassboro, N.J. In his first council run in 1999, Soares was cast as the underdog against Ed Stinson, a popular high school football coach. In order to introduce himself to the voters, he decided to address his dwarfism. "My feeling was that, look, it's who I am, it's what I am, it's unavoidable," Soares said. "And also it's a way to educate the public, who may not know about people of short stature." Soares, who handles campaigns for top clients such as AT&T and Phillip Morris as a creative supervisor at the marketing firm Wunderman in New York City, used his creativity and advertising savvy to promote his campaign. Photos were taken from overhead ("Because that's how people always see me," he explained), and the slogan on his brochures read, "We need a councilman who will stand up for the little guy." "It's been a disadvantage enough times that I might as well use it to my advantage," he said. "But I thought I used it in a tasteful way where it had a double meaning." The voters responded to Soares' calls for accountability to the taxpayers and controlled development in Hoboken, and he recorded an upset win. His job with the City Council, a part-time office, has added to the long workdays in the advertising industry and made life a little more hectic for Soares. But he said that he enjoys devoting his free time to Hoboken, his home for the past 11 years, especially now that his political career has moved past his stature and on to more important issues. "In the 2001 campaign, we didn't use the height thing at all," Soares said of his run for a second term. "I was another member of the group, and that's the way I really want to be remembered." Soares has earned respect for his quick wit, as well as his persuasiveness, in his first two years on the council. "He's got the best one-liners in the business," fellow councilperson Carol Marsh said. "I've never seen him back down from an argument. He's got guts." His bold style caused controversy in early 1999, before his first council campaign, when Soares, then the spokesman for Little People of America, spoke out against a Milwaukee-area Mexican restaurant that employed a dwarf who served nachos and salsa from a sombrero on his head. In statements to the news media, Soares called the practice "barbaric" and "disgusting," but he received little support from the restaurant community, the press or the man under the sombrero. He has no regrets about his unpopular stance, though. "I hold other dwarfs accountable for the way they act," he said. "I want them to hold me accountable, because there is a lot of stereotyping in this world. You get painted by ignorance or lack of education with the same brush." Soares is the first to admit that his dwarfism helped to shape his personality ("It makes me a little tougher and a little more short-tempered," he said), but at the same time, he wants to be treated the same as an average-sized person. And in his political life, that includes taking his share of criticism. "My opposition has called me a yuppie," said Soares, who drives a BMW with custom-fit pedals. "That they attacked me on that was great because it meant they weren't just looking at my size."